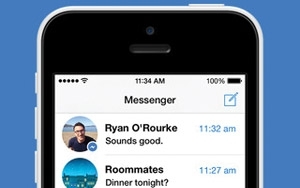 It looks like Facebook is finally ready to capitalize on its hugely popular messaging service. By the second quarter of the year, the social giant reportedly plans to begin putting ads directly into Facebook Messenger. At least initially, brands will only be able to send ads to users who have previously communicated with them through Messenger, according to internal documents obtained by TechCrunch. A Facebook spokesperson declined to discuss the company’s monetization plans for Messenger on Friday. Whether Facebook has similar plans for its WhatsApp unit is unclear. Paving the way for ads, Facebook has been increasingly positioning Messenger as central to business-to-consumer communication. Last year, the company added new ways for customers to send private messages to Page owners, and new tools for Page administrators to manage and respond to messages. In particular, Page owners were invited to add “Send Message” call-to-action buttons directly to their Facebook ads, and then reply directly to those users who message them. Thanks to their significant reach in more than 20 countries, Facebook Messenger and WhatsApp stand alone as “global powerhouse" chat apps, according to eMarketer. By comScore’s count, Facebook Messenger actually surpassed YouTube’s app in terms of consumer reach, last year. As of January, Facebook Messenger boasted more than 800 million users. Last year, the service saw a 31% increase in users. WhatsApp just surpassed 1 billion monthly active users and is presently processing 42 billion messages a day, including 1.6 photos and 250 million videos.